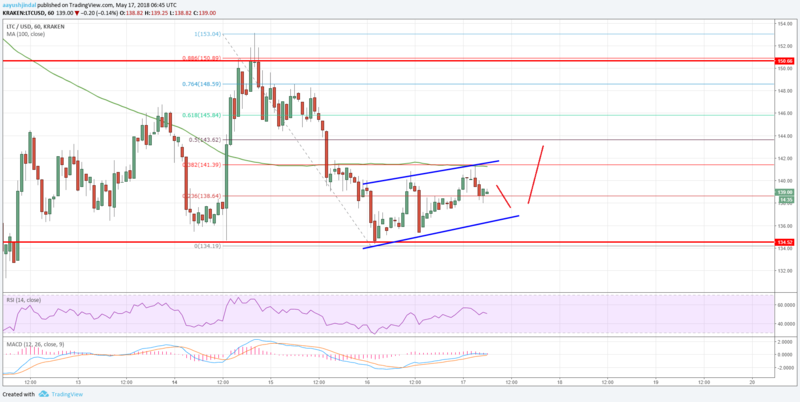 Litecoin price is consolidating above the $135 support against the US Dollar. LTC/USD has to move above $142 and the 100 hourly SMA to gain upside momentum. Litecoin price started trading in a range above the $135 support level (Data feed of Kraken) against the US Dollar. There is a short-term ascending channel forming with support at $137 on the hourly chart of the LTC/USD pair. The pair must break the $142 resistance and the 100 hourly simple moving average to recover further. After a major decline, litecoin price was able to hold the $134-135 support area against the US dollar. The LTC/USD pair started trading in a range and is currently consolidating above $135 with a minor bullish angle. Looking at the chart, the price was able to move above the $138 and $140 resistance levels. It also managed to move above the 23.6% Fib retracement level of the last decline from the $153 high to $135 low. However, the upside move was capped by a major resistance at $142 and the 100 hourly simple moving average. Moreover, the 38.2% Fib retracement level of the last decline from the $153 high to $135 low is also acting as a resistance for buyers. At the moment, it seems like there is a short-term ascending channel forming with support at $137 on the hourly chart of the LTC/USD pair. A break above the $142 resistance is required for a follow through above the channel resistance. A successful break above $142 and the 100 hourly SMA could clear the path for more gains towards $150 in the near term. On the flip side, if the price fails to move above $142 and declines, then the channel support at $137 may come into the picture. Further below $137, the price remains at a risk of more losses towards $134 and $130. The overall price formation is currently neutral above $135 with consolidation signs.